We all know that they are the tastiest foods in the world are deep fried. French fries, mozzarella sticks, chicken wings, chicken tenders, tater tots, potato chips, you name it! If it is deep fried, then chances are it’s going to be delicious. But deep fried foods come with A LOT of calories, and when you’re deep frying at home or outdoors, a traditional fryer also comes with a lot of mess to deal with. Given these considerations, the notion of something called an “air fryer”, which promised to fry foods with a tablespoon of oil or less, was very intriguing! Could it really fry my food with little or no added oil? Could it really be nearly mess free? What even is an air fryer? How does an air fryer work? An air fryer is a counter top appliance that you can purchase at Target, Walmart, Amazon and countless other retailers. There are many models available at all different price points, ranging from $58 all the way to over $200, depending on what brand and model you choose to purchase, but they all work in the same basic way: The air fryer utilizes convection via a small electric fan to circulate super-heated air around your food, in which you have drizzled in a tiny amount of frying oil, or have sprayed with a light coat of canola oil from a can. 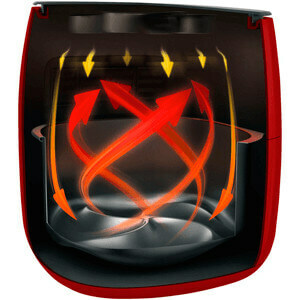 The super heated air makes contact with the small amount of oil on your food and heats the oil. The oil then begins to do what oil always does when it gets hot: it fries your food! Food comes out perfectly brown and crispy due to the Maillard Effect. The effect is the chemical reaction that takes place between amino acids and the reducing sugars in your food when you brown, fry or sear anything; essentially, it is why browned food tastes so good. The air frying method of frying food gives you a crunchy finished product which is very similar to traditional deep frying, but without having to soak your foods in a huge vat of oil, allowing them to absorb tons of extra calories. But does it really work? The answer is yes! I have tried air frying a multitude of items, and I have achieved some pretty great results. Air frying appliances are especially good at preparing prepared, frozen foods such as breaded chicken strips, fish sticks, and frozen french fries. I didn’t get that same dense and snappy crunch that I would normally expect from deep fried foods, but everything I prepared in the air fryer came out with a nice, light and crispy texture that tasted as though it has been at least pan fried, if not outright deep fried. When I saw how easy it was to get good results, I was hooked! The question is: what else can I fry with this thing? My frozen foods turned out beautifully, but in reality, I rarely buy prepared foods like that, so I wanted to test the versatility of the item with homemade recipes. The first thing I tried to make on my own was breaded chicken strips, one of my husband’s favorite foods. I prepared the chicken strips the exact same way I always do, using the same spices and seasonings that I always do, with one minor change: I mixed a little bit of vegetable oil into my bread crumbs mixture. I didn’t need much, only a tablespoon or so, for the entire batch. The purpose of this is to provide just enough fat on the surface of the food that the super-heated air produced by the air fryer can come into contact with, and fry the food. The chicken strips came out tender, moist and delicious! I was amazed, and the meal was an instant hit with my whole family! 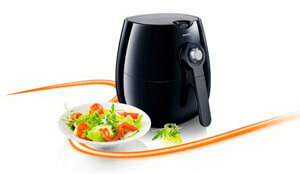 Another wonderful feature of air fryers is how fast they prepare your food. Honestly, the prep time and the time it takes to load all your goodies into your air fryer tends to take longer than actually cooking them. In mere minutes, you can easily have plate after plate of tasty, air fried snacks ready to go for your family and friends! Cooking frozen french fries takes less than ten minutes. Cooking frozen tater tots takes less than twelve minutes. And my chicken strips? They were completely through cooking and ready to enjoy in just eleven minutes. I couldn’t believe the time saving capabilities of air fryers. I know what you’re thinking: are there any drawbacks? Yes, there are a few drawbacks to the air frying method of food preparation. First, if you’re trying to air fry vegetables, your best bet is to use frozen vegetables rather than using fresh. The reason for this is that frozen vegetables have been through the freezing process. The process of freezing transforms all of the naturally existing water in the vegetable into ice crystals. Ice crystal are razor sharp and as they form they sort of cut up and soften the fibers of the vegetables. This makes them fry up much more evenly, and produces a more consistent and pleasant texture in your finished product. If you’re a strict vegetarian or vegan, the air fryer might not be the best choice for you. That being been said, it can be the ideal solution for households with a fast food or fried food habit that want to reduce their calorie intake while still being able to eat most of their favorite foods. The air fryer was also not the ideal method for making homemade potato chips. I tried to make these several times with several different kinds of potatoes, including the ever popular sweet potato, but each time the results were the same: the centers of each chip remained soft while the outer edges were slightly burned. Although the results of the potato chip experiment were not what I had hoped for, my ultimate love of the air fryer was not diminished in the slightest. Perhaps the best part of choosing my air fryer was that I no longer needed to deal with my regular counter top deep fryer. Now, don’t get me wrong, I loved my traditional deep frying appliance, but it was very messy to use, it was difficult to clean and whenever I used it I needed to make sure I had several quarts of fresh vegetable or peanut oil ready to go, adding to the operating cost of the appliance. When I was through using my deep fryer, I then had to figure out how to dispose of the several quarts of frying oil that I had used, which you can’t just pour down the drain, because it can cause plumbing problems later on down the road. Lastly, a traditional deep fryer is dangerous. Counter top deep frying appliances can heat oil to over four hundred degrees Fahrenheit, which is more than hot enough to cause serious scalding or burns if the oil is splashed or spilled. Hot oil can also easily ignite towels or napkins, which it comes into contact with, starting a grease fire which is extremely difficult to put out, as water cannot be used to extinguish a grease fire, only smothering will put out a grease fire. With the extra cost, mess and risk of the traditional deep fryer, choosing to switch to the newer, more modern air frying method of food preparation seems like an obvious choice. There is something magical about a device that can deliver results this tasty without adding huge amounts of fat to each dish. In my opinion, the people who would benefit the most from the purchase of an air fryer are those who eat frozen food regularly. This is because of how well frozen foods cook up in just about any model of air fryer available on the market today. You also need to consider the amount of counter space you would be sacrificing to this particular appliance. It isn’t a massive object by any means, but it does take up a decent sized footprint on the kitchen counter, and if space isn’t something you can afford to give up, this might not be the right purchase for you. 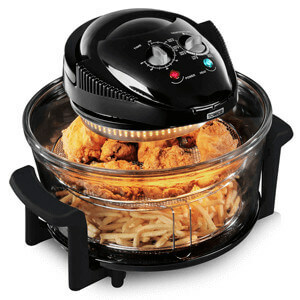 However, if you are looking for a fast, fun and easy way to prepare all of your favorite fried snacks while also seriously cutting calories, you should run out and purchase your new air fryer right away!